WHEATLAND, Mo. — In a thrilling 17th-to-first drive, Bobby Pierce captured the third annual Lucas Oil MLRA Fall Nationals finale on Saturday night at Lucas Oil Speedway. Pierce passed Jesse Stovall — who clinched his first MLRA championship — on lap 49 of the 50-lap feature and denied Stovall of a weekend Fall Nationals sweep. A night earlier, Stovall beat Pierce to the finish line. Pierce now has 23 feature victories this season, including the World 100 and North-South 100 crown jewels. Pierce brought the big crowd to its feet when he passed Stovall coming out of turn two on the next-to-final circuit in the season’s final MLRA race. Stovall slipped high, into the cushion, and lost momentum as he encountered slower traffic. Stovall’s disappointment at finishing second was softened by his MLRA championship. He entered the night with an all-but-insurmountable 74-point lead over reigning champ Terry Phillips after capturing Friday’s Fall Nationals feature win. 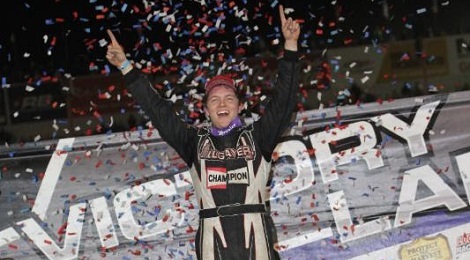 “That was the ultimate goal,” said Stovall, who finished just behind Phillips for the series crown a year ago. Chris Simpson, Tim Manville and Garrett Alberson completed the top five. The Comp Camps Super Dirt Series, which was co-sanctioning the Late Model portion, crowned Jack Sullivan as its champion. Sullivan finished sixth with series runner-up Hunter Rasdon in 13th — three points behind Sullivan. A Feature (50 laps): 1. Bobby Pierce, 2. Jesse Stovall, 3. Chris Simpson, 4. Tim Manville, 5. Garrett Alberson, 6. Jack Sullivan, 7. Will Vaught, 8. J.C. Wyman, 9. Brian Shirley, 10. Randy Timms, 11. Tony Jackson Jr., 12. Dave Eckrich, 13. Hunter Rasdon, 14. Brantlee Gotschall, 15. Payton Looney, 16. Kyle Beard, 17. Jason Papich, 18. Mason Oberkramer, 19. Brent Larson, 20. R.C. Whitwell, 21. Terry Phillips, 22. Chris Brown, 23. Tad Pospisil, 24. Mark Burgtorf, 25. Matt Furman, 26. Billy Moyer.